This volume is the fourth in the Franklin K. Lane series on the governance of major metropolitan regions. The series is sponsored by the Institute of Governmental Studies and the Institute of International Studies, University of California in Berkeley. Readers of these volumes and other relevant literature will no doubt agree with the authors of this book that similar patterns are found in New York, London, Toronto, Stockholm, and indeed in "every other major metropolitan region in the United States and in other advanced industrial societies." 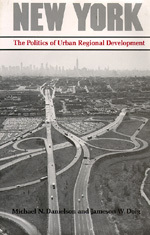 The presence of such common factors and trends, although they assume different configurations in various metropolitan regions, has been demonstrated by the work of many scholars, including Peter Hall, Brian Berry, Marion Clawson, Jean Gottmann, Larry Bourne and William Robson, as well as by the authors of the other Franklin K. Lane books—Donald Foley, Albert Rose and Thomas Anton. In the present volume Michael Danielson and Jameson Doig have described and analyzed the cultural, economic, political and other social forces shaping development in the New York region. They present a picture of a region singular in its attractions, problems, geographic scope, magnitude of development, and complexity of the network of organizations involved in its governance. Michael N. Danielson is the B.C. Forbes Professor of Public Affairs, Emeritus and the Professor of Politics and Public Affairs, Emeritus at Princeton University. Jameson W. Doig is the Professor of Politics and Public Affairs, Emeritus at Princeton University.